Predictive analytics should allow companies to design a data driven strategy, ranging from improving operations, increasing revenues and market share, designing and customizing product/services, monetizing on owned data. If you have the following questions, then we have the answer for you! How to set up a company to harness the power of Data-Centric decision making? How can we make sense of all the jargon and fast moving technologies? How to make your organisation follow your vision? How could product innovations aﬀect the way we set up oﬀers and content? And what are the signs of tomorrow for online shopping? Will Cognitive Computing emerge from Machine Learning Algorithms, Big Data Tools, and Cloud Services? Which customers are probable to leave a free-to-go mortgage within a specific amount of time. Prioritization of big data projects in insurance and banking industry European insurance and banking industries increase Investments in Big Data & Digital Initiatives. What major role and benefits do these investments have? Machine learning in modelling fraud patterns? How to develop of predictive analytics services for peers? Predictive analytics for business and social good? Delighting Customers with Big Data and Advanced Analytics! 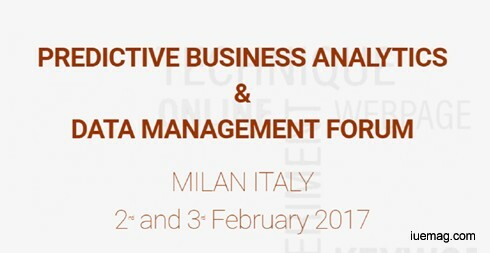 Global Predictive Analytics and Data Management Forum with its venue in Milan, Italy on 2nd and 3rd February 2017 is a cross industry and NON-vendor driven event with more than 20 global senior speakers from all over the world. Speakers from Great Britain, USA, Italy, Germany, France, Switzerland, Nordic Region, Middle East etc. will present their case studies, share their experience and expertise in predictive analytics, data management and digital transformation of their companies. eBay, Honeywell, Airbus, Turkish Airlines, Barclays, Generali, Commerzbank, Telefonica, Adidas, Pirelli, Samsung, Renault, Toyota, Nokia, and many more have sent their senior experts in the field of Data and Business Analytics to represent their company in this two day forum in Novotel Milano Hotel to discuss the topics bellow. - Transition from BI analytics to data science. - Machine learning in modelling fraud pattern. - Are we reaching a data science singularity? Any facts, figures or references stated here are made by the author & don't reflect the endorsement of iU at all times unless otherwise drafted by official staff at iU. This article was first published here on 11th January 2017.